Schonell Events & Catering is owned and operated by the University of Queensland Union (UQU). We are an independent non-for-profit organisation, and any surplus funds help foster a more vibrant campus life for UQ students. Schonell Events & Catering has provided outstanding catering and venue services to UQ staff, students and the wider Brisbane community for more than 20 years. Our new menu offers a diverse range of casual, cocktail and formal dining options. Our staff have decades of combined catering expertise, and pride themselves on combining delicious cuisine with premium customer service and competitive prices. As well as catering, we can provide the ideal venue for your event, plus services available for styling, equipment hire, staffing, security and entertainment. We also offer customised events tailored to your needs. Set amongst spectacular gardens & picturesque sandstone buildings, the University of Queensland in St Lucia provides an elegant, all-inclusive setting for your next event. With river frontage, lakes & iconic sandstone buildings the historic campus surroundings include stunning ceremony locations & private rooms complete with balcony views. Only a ten minute drive & 4km from Brisbane’s CBD, the University of Queensland, St Lucia has eleven direct bus routes and is just two City Cat stops from the city centre. Our central location means that the venue is easily accessible for guests staying in the city or travelling from south of the Brisbane River. Set amongst spectacular gardens & grand sandstone buildings, the University of Queensland at St Lucia delivers the perfect setting for your perfect day. Our passionate & dedicated functions team will work with you and your partner to personalise all arrangements, so that your day is a perfect reflection of you as a couple. Schonell Weddings and Events has a variety of flexible and affordable spaces for your next corporate event or function in Brisbane. Only a ten minute drive from Brisbane’s CBD, & is just two City Cat stops from the city centre. Our central location makes our venues easily accessible for city-based delegates & those situated south of the Brisbane River. If you are having a function, conference or luncheon that needs to make an impact, Schonell Weddings & Events can cater to your every need including on campus delivery. Our tempting new menu offers a diverse range of platters, individual picnic boxes as well as morning and afternoon tea. Our staff have decades of combined catering expertise, and pride themselves on combining delicious cuisine with premium customer service. I’ve worked with Schonell Events many times now and have never been disappointed. Great venue, great staff and great catering, all at a very reasonable price! We will keep coming back! I first used the services of Schonell catering for a private event in 2016. Based on their excellent service, presentation and quality of food, I enquired about the possibilities of them assisting me with a week-long corporate event consisting of 28 sessions, 1000 people and a small budget. The Schonell team were amazing! Not only did they provide a fabulous arrangement of food and beverage choices, they also kept up with our busy schedule despite many “on the day” changes. Since that week, we have chosen Schonell to cater all our corporate meetings and events. The food is always fresh and the portions are plentiful. Presentation is always immaculate and their pricing is the most competitive I have seen. I just wanted to send a very belated thank you for your help with the Future Jobs Forum. Thank you for being so flexible. Your staff were excellent. Just wanted to say a huge thank you from Nick and myself! Everything went absolutely beautifully and your staff were amazing. The food was beautiful too, and I think everyone went away quite full by the end of the night! Thank you for the most magical, fabulous, beautifully smooth wedding anyone has ever had! I couldn't be more satisfied with how the day went and the reception food was just fantastic. Thank you for making our day so perfect, affordable, classy and easy. Schonell Events & Catering aim to be sustainable in our business practices. 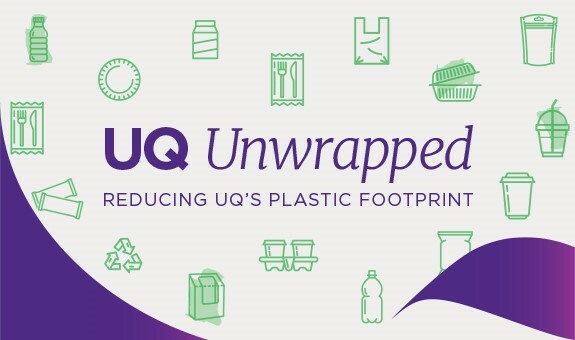 We are proud to be a member of the UQ Unwrapped program and are committed to reducing plastic on campus. We use reusable serveware and all our disposable packaging is biodegradable or compostable.